The "Sunset Oia" Lagoon 500 is a luxurious sailing catamaran open for charter. Built in 2009 in Bordeaux France this lagoon 500 type catamaran offers a combination of comfort, luxury and performance. 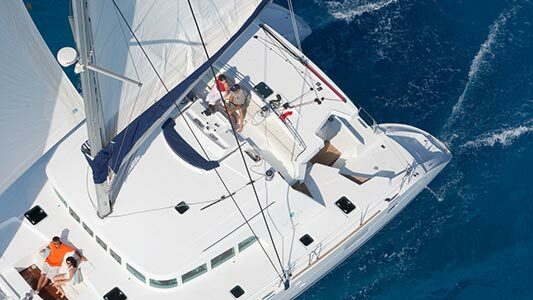 With a lot of space both over and below the deck, a beam of 28 feet, two 75hp Yanmar diesel engines, 1,722 square feet sail and overall length of 51 feet the “Sunset Oia” Catamaran is a real piece of art with plenty of horsepower. 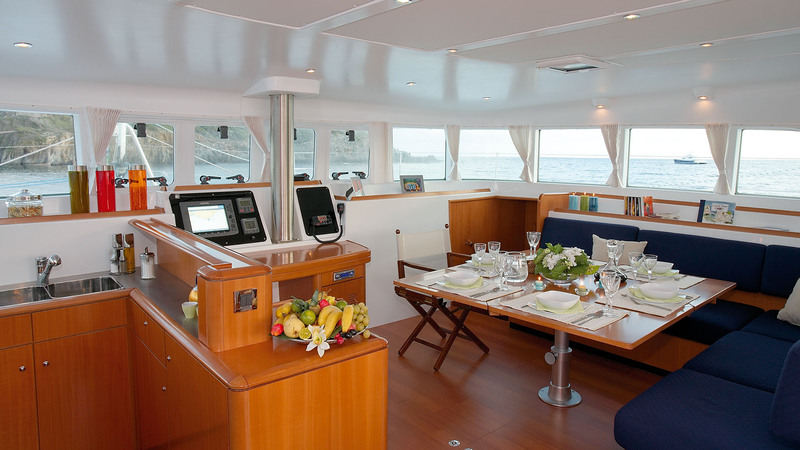 Creating a sense of elegance and luxury this lagoon type catamaran stands out for its steering station above, offering additional space with a welcoming six-seat bench and access from both sides. A spacious dinning and lounging area with comfortable seats and a table lies under the helm. Passengers can hear the sounds of water lapping against the hulls while resting on the cozy sofa with table in the saloon located on the bridge deck. 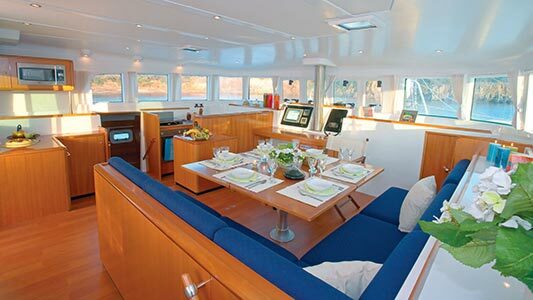 With a four-burner hob, an oven with grill, a fridge and a freezer as well as all up-to-date electric and electronic navigation systems the galley has been designed to provide an exhilarating dining experience. 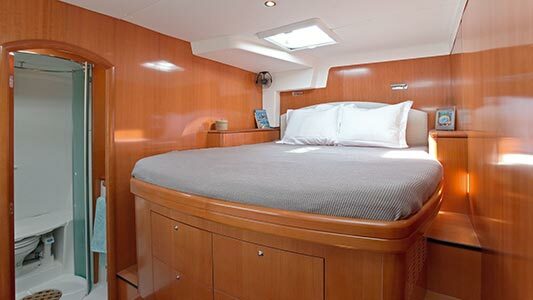 The “Sunset Oia” Lagoon 500 features 5 guest cabins, 4 of them fitted with a queen size bed and 1 with bunk beds all with private shower and W.C. The “Sunset Oia” Lagoon 500 is available for rent for private 5 hour cruises to the enchanting island of Santorini or daily adventures to neighboring islands according to individual needs. 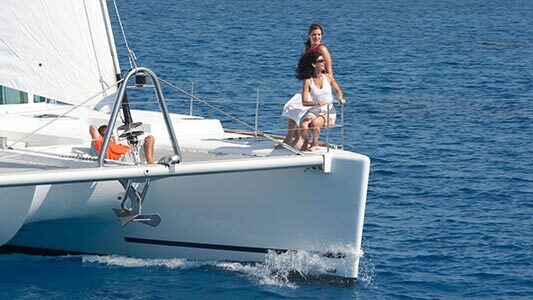 For daily sailing trips to other Cycladic islands such as Mykonos, Paros, Milos, Amorgos and Ios this catamaran can accommodate up to 8 passengers and the crew. For 5 hour morning escapes or sunset cruises the “Sunset Oia” Lagoon 500 can host more than 16 people and for special events such as wedding ceremonies the number of people can add up to 25. Our magnificent tour with our catamaran Lagoon 500 starts at 10.15 from Ios port. There is a roundtrip transfer from your hotel provided by our mini buses. The Lagoon 500 has an award wining design for its comfort and space. First stop: ± 30 minutes at Maganari, the charming bay of the southern side of the island, for swimming and snorkeling. Second stop: ± 120 minutes at the Tris Klisies with the crystalline waters for swimming, snorkeling and for the barbeque on board. The tour finishes in Ormos and our buses take you back to your hotel. The sunset tour with our catamaran Lagoon 500 starts at 15.30 from Ios port. There is a roundtrip transfer from your hotel provided by our mini buses. 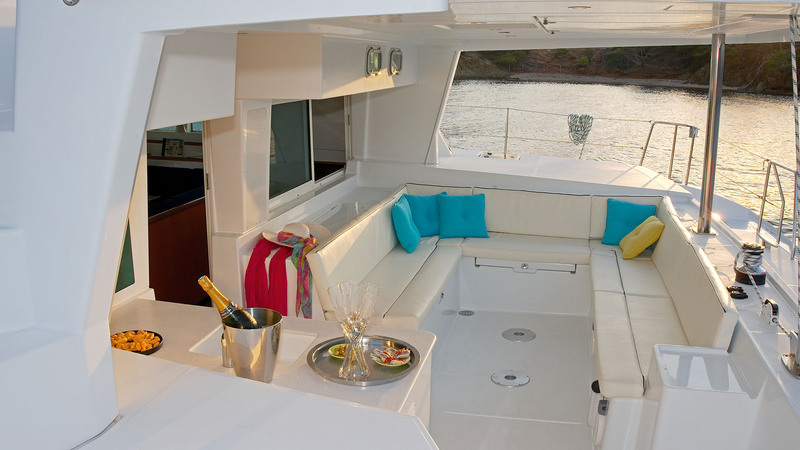 The Lagoon 500 has an award wining design for its comfort and space. Sailing near the lasy beaches of Ios. Second stop: ± 1 hr & 45′ minutes at the Tris Klisies with the crystalline waters for swimming, snorkeling and for the barbeque on board. Last stop:below Koumpara beach, at Maniates for watching the sunset from the best point on the island.